Big thanks to csmertx for the render! 10.22.15 - Thread graphics updated and some reorganization. 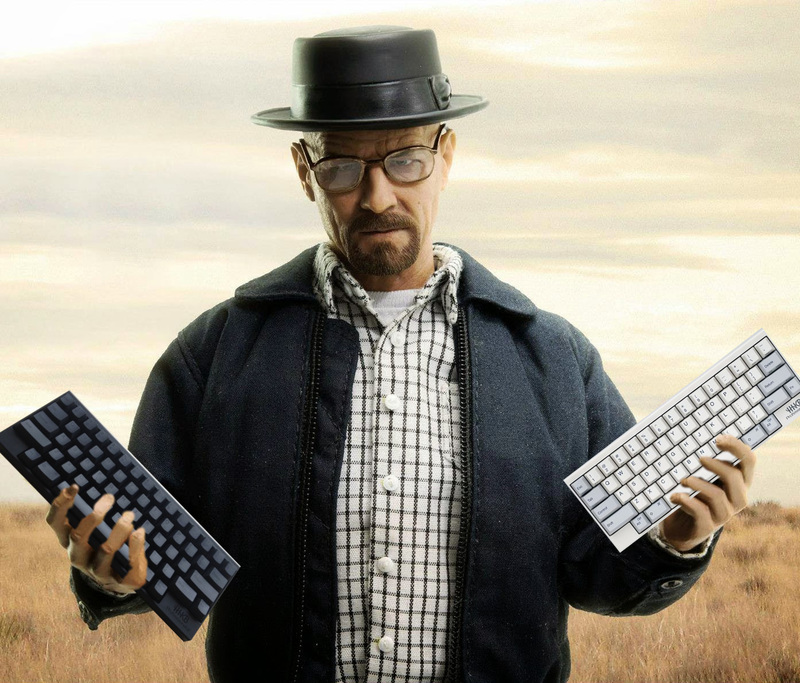 10.23.15 - Base & Gamer kit tweaks, more novelties added, mac commands added to Alt. Modifiers by request & new 'unfinished ideas' section added. 10.30.15 - V2: All kits updated to reflect new colorway, alternate alpha, aurebesh alpha and allegiance kits added as well as a stripe, gamer and novelties kits tweak. 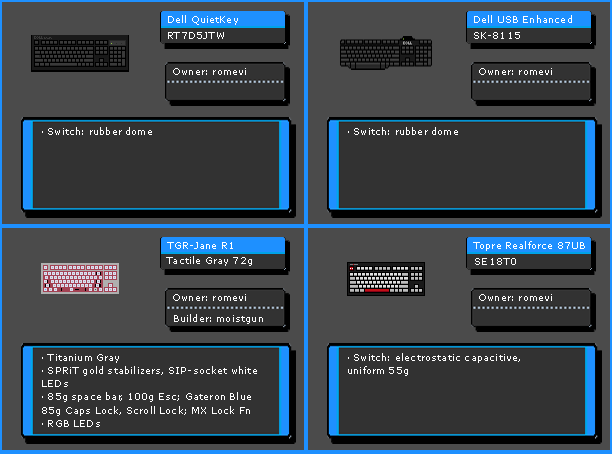 11.07.15 - Added stepped Caps Lock to non-standard & added a Space Bars kit with 6.25 & 7u sizes. 11.12.15 - Merged allegiance kit with novelties & added a Helmet & Rebel logo to novelties. 01.21.16 - V3: Colors updated, chestpack kit replaced 'Gamer kit', ergodox kit added & aurebesh alphas updated with homing keys. 01.29.16 - Split alphas & mods, added gray mods, stripe and 6.25 & 7u spacebars as well as a tweak to the ergodox kit. Added a few temporary samples also. 02.04.16 - Added gray & white adapter options and shortened the stripe kit to include just the 'number' row. 02.07.16 - Tweaked the adapter kits, moved stepped caps lock to mods kits, tweaked the ergodox kit, added the planck kit & a homing pack. 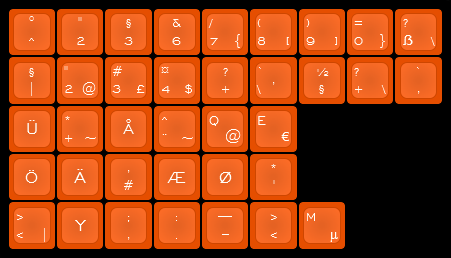 02.09.16 - Planck kit updated & orange 1u added to relegendables pack. 03.03.16 - Added some keys to the numpad kits, gray mod keys to the iso kit & added a few punctuation keys to the planck kit. 03.04.16 - Added punctuation keys to the Aurebesh kit & updated Planck kit. 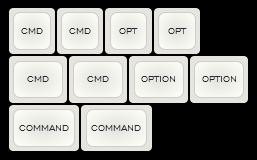 03.05.16 - Added 1.25u FN key to adapter kit, added the original version of the 'Stripe' kit back, changed 'ENTER' to 'RETURN' in ISO kit, changed mods to white in the Ergodox kit & added v1 of the community pack. 03.06.16 - Reorganized the OP a bit, slimmed the adapter kit to keep it cost efficient & added an accent kit themed after the pilot chestpacks. 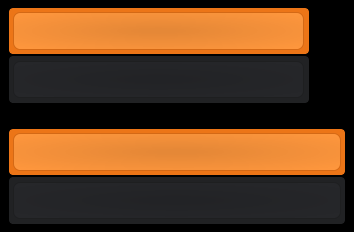 03.12.16 - Base & Mod kits layouts were altered slightly. White was also changed to WFK and the dark legends to NN. Colors will be finalized once the chips arrive. 03.19.16 - Modifier & Adapter kits updated. Added Mac & Gamer kits. 03.21.16 - 7u bars added to Adapter kits & Polycarb 'Visor' spacebars added. 03.25.16 - Adjusted color of the polycarb options in the Bars and Gamer kits & added to the Planck kit. 04.05.16 - Gamer pack tweaks and added D & K keys to the Homing Pack. 04.10.16 - Size adjustments to most of the modifier keys in all packs, black 2u re-added to Planck Kit and black 6.26/7u added to the Polycarb spacebar options. Stripe & Ergodox kits were also updated with requests. 04.13.16 - Reorganized OP. Added Meta key and changed 'Enter' to 'Return' in the Modifiers. Removed symbol legend options from the Mac kit. 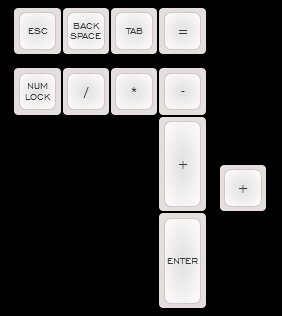 Incorporated homing keys in to their respective kits and moved the standard variants in to the Homing kit. Added 7u spacebar to the Alphas. 04.24.16 - First draft of the International kit & Novelties was added to the OP. 05.08.16 - Tweaked the Modifiers a touch & added a Aurebesh numpad option. 05.25.16 - Tweaked both Alpha kits, added stepped caps to Mods kit & 7u spacebar added to Adapter kit. 08.02.16 - Changed the WIN/MENU keys in the Modifier kit, changed the arrows in the Aurebesh kit to standard arrows & simplified and cleaned up the Gamer pack. 10.15.16 - New renders for Standard Alphas and both Gray & White Modifiers added. Working on the rest. Or have shared novelties and make one set an "extension" of the other? Or keep them separate if the colourways can't match up, I'm sure true diehard Star Wars fans wouldn't mind having more keycap options. I had a quick chat with him already but I think we'll probably just continue with our own things for now. I hope he does get that out eventually. How about an A-Wing novelty cap? The X-Wing seemed to work out the best because of the shape. The other thing is, I'm not sure if I could even get them printed. You are part of the rebel alliance and a traitor. Take her away! BTW, if you want to match the red, yellow and/or grey to what they used on the helmets and props in the movies, you need to look no further than Humbrol enamel paints - because those are what they used. The range was limited back in the 1970's, so look at the lowest paint numbers first. Awesome idea, I'll have to take a look. 'I have a bad feeling about this,' said my wallet. Very cool idea. Got to think of some way to get those trademarked legends made! 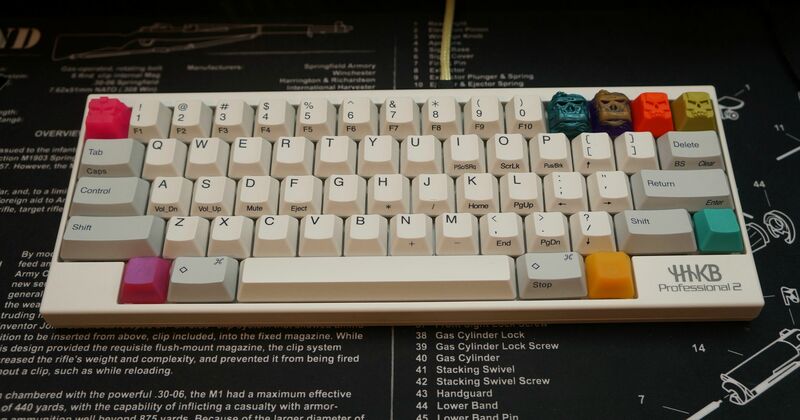 These are the keycaps you are looking for. I'd really like too, I know it would probably be pointless to try and contact Disney but I may try for the hell of it. Also, while I'm here, how about some Aurebesh alphas? Would probably be insanely expensive but always an option. Maybe some Aurebesh novelties would be better. I have no idea where to begin with this type of stuff. 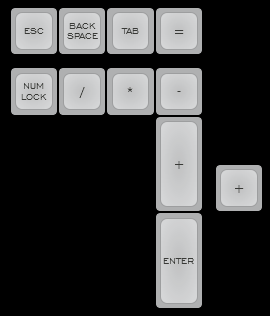 This was done with a java app written by someone from /r/keycapdesigners. Saying that, it's not 100% accurate to my set but it gives a decent idea of what it'd look like. Would these be possible with dyesub even if the rest of the set is doubleshot? I think Gateron can mix up custom PBT colours, but they seem to be slow with this sort of thing, I think this is what Ivan did for the Black on Black PBT GB. If you go this route, you also have to get them dyesubbed by a third party (like IMSTO), whereas SP can do everything in-house. Interesting idea. I'll be following this. Interesting. I guess the first thing I should do is figure out the profile. 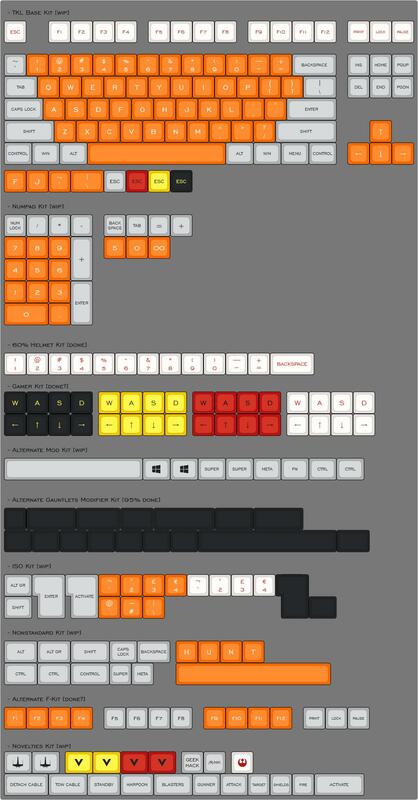 I was leaning towards DSA or R3 SA mainly for personal preference. Then I'll go from there. Thank you. Anyone have other thoughts on profile or should I get some type of poll set up? If you do want a poll, just PM a mod to set it up. And in case you aren't familiar, you can see which mods are online by going to the bottom of the homepage and seeing which usernames are blue/purple. 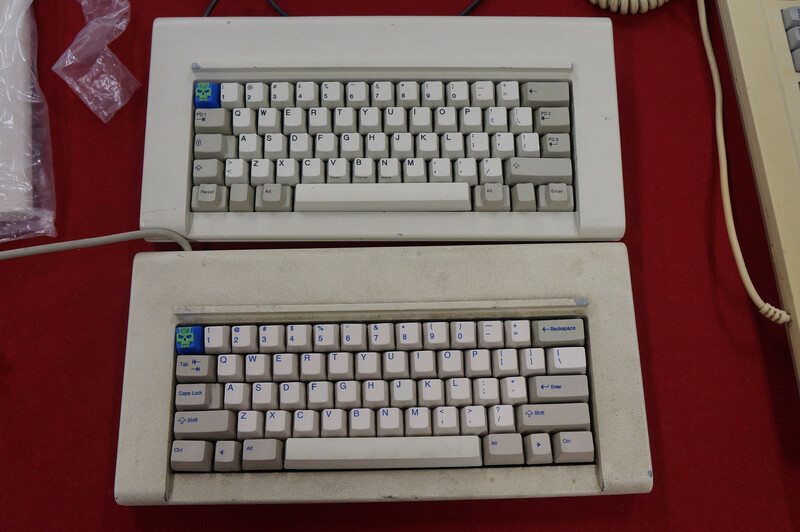 Yes, if you use DSA or DCS you could make dyesub alphas with the rest doubleshot, but the dyesubbed caps would be PBT and the rest ABS. I believe he was referring to the dark legend version of the "Aurebesh" alphas being dyesubbed and the "rest" (modifiers, etc) doubleshot. It would be quite expensive to make the alphas doubleshot since they'd have to cut legend molds for all the letters. Correct. I'm not going to worry about those for now. I'm going to concentrate on the profile and getting the initial sets dialed in first. Then I want to find someone to do some 3d renders and go from there with any additional add ons. I'm going to go out on a limb here and say that I NEED the TKL w/Gauntlets. This is an awesome looking set! Patience my young keyboarder, soon your time shall come. I updated OP with some new graphics and reorganized some things. Also shifting gears ever so slightly. My original ideas were based mostly off Luke Skywalkers uniform. I've decided to just design it based around Rebel Alliance pilot uniforms in general to open up more possibilities. Tweaked KLE renders and some new stuff coming later. The orange was pretty glaring at first, but taking another shot I think I can work with this! I thought it would be that way too, but the more I work on this set the more I fall in love with it and sincerely hope it makes it to the GB stage. I wont stop until it does. Thanks for giving it another look! OP updated. Check 'worklog' in 2nd post for changes if interested. 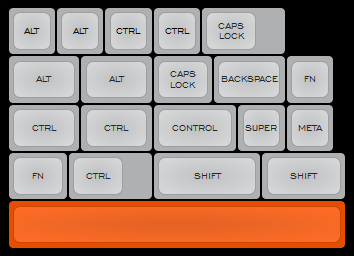 A lot of orange keycaps out there lately. 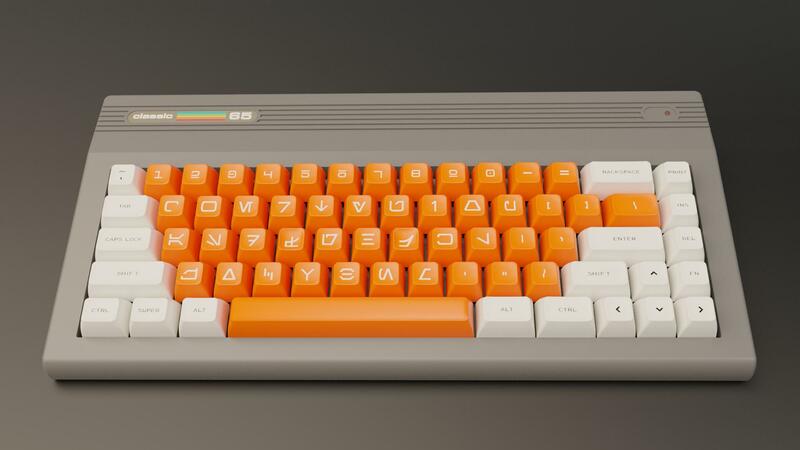 First Skidata+, then JTK, and now possibly this and the orange mods in Green Screen. I agree. That's one reason I'm playing with some other options as I know Carbon had an orange alpha option, then the 2 you mentions. I'm trying to keep it looking like other sets, while still sticking to the theme as much as possible. I didn't cross check to see if any of these colorways had similarities, so hopefully they don't lol. And on second glance, I could probably do the first 2 kits combined in to 1 set by offering an alternate alpha option if there was interest. I kinda favor the first two also. The both look sharp. It's nice, but maybe not for me. Those candy corn clacks will have a nice home.. Lol. YES! You hit the nail on the head for me. I love the unfinished idea set. Could it possibly be its own Base set with the arrow keys? I would totally get that with the number pad set and novelties. Set looks great so far. Can't wait to be able to buy it. The grey alphas with the white strip on top is pretty dope. I'd be interested in that one. I am really liking the aurebesh text. Not sure I am a fan of the orange though. Nice keyset design! Any chance of being sued by whoever that owns the rights to SW? Otherwise, the set looks good, if there are no legal issues. The only way would be the novelties with the xwing and rebel logo, neither of which will probably make it unfortunately. Thanks to everyone else that checked it out and left feedback. New renders will be up soon. This looks so good. I'd be in so fast. I've updated the OP with a bunch of updates that I've been working on. 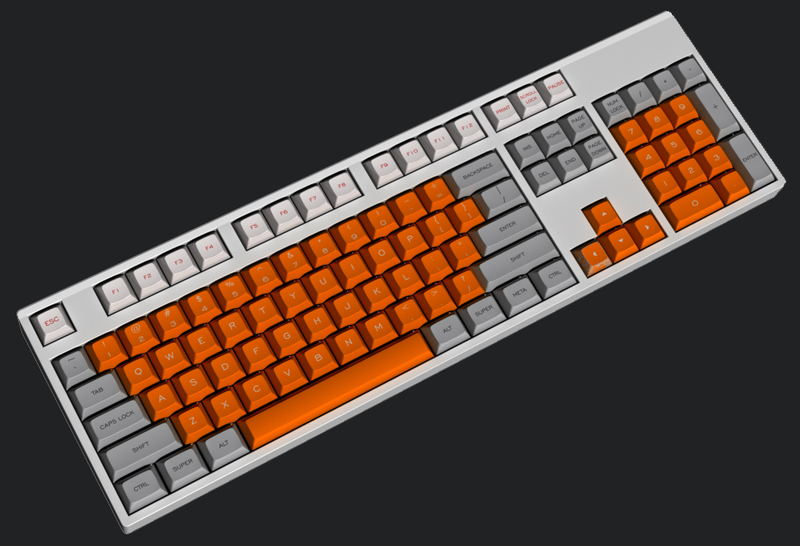 Also, after a quick email with Melissa from SP and a message to CQ_Cumbers, I will be adding a couple orange and yellow polycarb keycaps to represent the helmet visors. 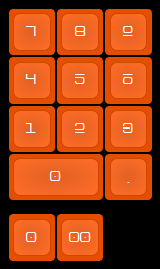 I'm not exactly sure what keys yet, but I tossed a couple in the novelties kit for now. I'm really liking the new colorway, not so much in-your-face with orange. Let me know what everyone thinks. Thanks to everyone that has showed interest, commented, left feedback or messaged me so far! Oh and 1 other thing.. 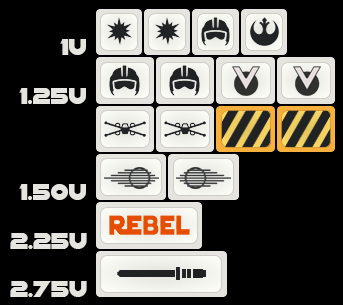 I hope to have some info back soon regarding the X-wing and Rebel logo novelties. Personally, I'd like to do SA.. most likely SA R3, if anything to give it more of a 'retro' feel. I saw a custom key in keypuller with the Lambda logo made by Signature Plastics, and I was wondering if Valve agreed to it. Unlikely that Disney would let you use Star Wars related images, but I'm curious how it worked for the Lambda key. I think it's a new thing they are doing. They printed the Nuka Cola dsa caps for 00zeRO and on his planned SA run they wanted permission to use it. I haven't asked SP myself so he would know their reasoning. 2u Row 1 Backspace, 2.25u Row 3 Enter, 2.75u Row 3 Shift. Note how the 2.25u has gaps either side of the support and the 2.75u has it shifted over to the right (left side when viewed from the top of the cap). I'm not yet sure what the Row 4 version support looks like, but should have that info soon. Will there be an international kit? Would that affect a blank cap as well, or just if the cap had a doubleshot legend? I'm going to concentrate on getting the initial kits nailed down and enough interest going first. If there's demand for it as well as ergodox kits and other layouts, of course they will be implemented. Yes, unfortunately it affects both since they use the same final mold which includes the space for the first shot insert. I think 2.25u would look pretty good, actually, since it's symmetrical, but 2.75u may look a bit odd. Anyhow, was just a heads up about the structures. Set design is looking very good, by the way. I like it a lot. Just looked over the renders again. No stepped Caps Lock? You can probably throw that in the Adapter Kit.